This is a culmination of work from my dissertation that recognizes the service of women Veterans and their experiences before, during, and after their military service that ultimately lead to the use of mental health outpatient services. My interest in this work stemmed from my professional and personal passion to advocate for vulnerable women and amplify their voices. Women Veterans face tremendous obstacles from the pressures of military service, but I wanted to delve deeper into their lives before and after service and explore what led them to the military, and what happened to them once they left. Not being a Veteran personally, I was concerned about my placement as a researcher, and that participants would perceive as someone seeking to exploit their stories. Fortunately, I had the support of my advisors: Drs. Carol Pavlish, Sally Maliski, and Donna Washington in exploring this topic by preparing me with the tools to respectfully approach, and interview this group of women. I used Constructivist Grounded Theory methodology, as articulated by Charmaz (2014), to inform the development of the interview questionnaire with a focus on decision-making for outpatient mental health services. Using that as a starting point enabled me to maneuver backward and forward in how I approached the interview and the questions I asked. In the course of completing this study, I was honored to interview these women and hear their powerful stories, which were undoubtedly marked by trauma throughout their lives, which became one of the major categories of my model. Another incredible part of their stories were the ways they renegotiated the place, and inherently the value, that trauma had in their lives. They were able to see the positive aspects of their service and see themselves as survivors. 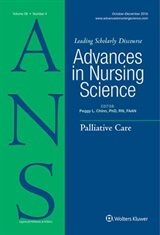 I believe this study has policy and practice implications within and outside of nursing practice. As more women serve and leave the armed forces we have a responsibility to anticipate their needs, advocate for their care, and have timely, trauma-informed, gender-informed care at the ready at all points along this trajectory. Charmaz K. Constructing Grounded Theory. 2nd ed. Thousand Oaks, CA: Sage Publications; 2014.